Democratic Leader Nancy Pelosi says, "Now is not the time to consider articles of impeachment." Impeaching Donald Trump, she says, would be a waste of time because "he's just not that important." 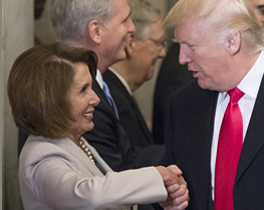 Pelosi claims that impeaching Trump would "divide us, not bring us together." Now is indeed the time to move forward on numerous documented and indisputable impeachable offenses. We urge you not to limit impeachment to the topic of an investigation by a special counsel and then to use that investigation as a rationale for stalling. Impeachment need not and cannot wait.